This is a must see house. The hosts are incredible too 🙂 very kind, funny and warm. The house and pool are out of this world. One of my favourite places I stayed in Mexico. My only regret is not staying longer. Thanks legends! Loved my stay – your house and both of you are beautiful. Wow! What a gem. All the beautiful pictures don’t do this Old Colonial hacienda justice. We both love architecture and plants, so we were in heaven. I must have taken 20 pictures of ‘flowering’ plants. The hostess’s Carolyn and Crystal were amazing, communications about getting there and what to see were right on. The location was great, 20 minutes from Merida and 20 minutes from the beach. Baca Is a quiet little town on the outskirts of Merida. Don’t miss the Sunday festival, market in the city center of Merida. This was the highlight of our trip. Nuestra estadia en casa Lunita fue muy placentera. El lugar es mágico hicieron un gran trabajo con la casa. Nos relajamos en la piscina, en las hamacas leyendo. El desayuno estuvo delicioso. Espero regresar pronto. What a wonderful place hosted by two wonderful hostesses! 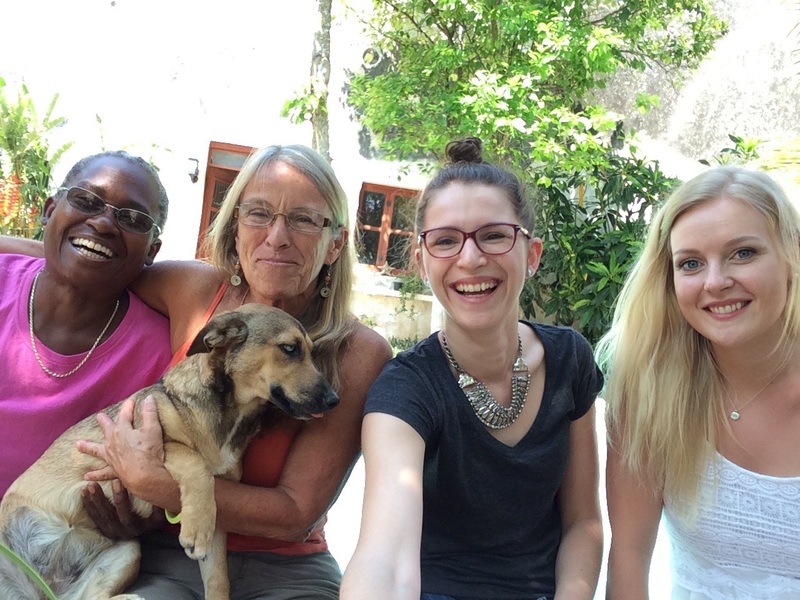 Carolyn and Crystal (and their 2 sweet doggies) made our stay memorable. The place is beautiful, comfortable, and a short (1/2 hour) drive from Merida. They provided a delicious breakfast every morning, and were delightful to talk with. We highly recommend, and if we return to the area, look forward to staying again. Amazing! We stayed for 2 nights and wish we had stayed for 2 months. The photos do not do the house justice… it is stunning. Baca is a wonderful town and we felt like we were experiencing an authentic side of The Yucatán. Access to and from Merida was really easy so don’t let this put you off! Carolyn and Crystal were amazing hosts, great conversation and delicious breakfast! 10/10 would recommend. The house should be a museum! Its gourgeos. And Caroly and Cristal are two wonderful sweet women. Totally recommended! Friday night and Saturday until noon mi wife and I had a wonderful stay at this beautiful old house just around the corner from Baca’s main square. A Casona typical of the grand days of the sisal industry in Yucatán with a simple yet tasteful renovation, we could not feel more at home and at peace in the company of their owners and their cute dogs. A highly recommended stay for anyone, local or foreigner, who wants to relax and explore a quintessential colonial rural town in Yucatán just a half hour from Mérida. This picture says it all. 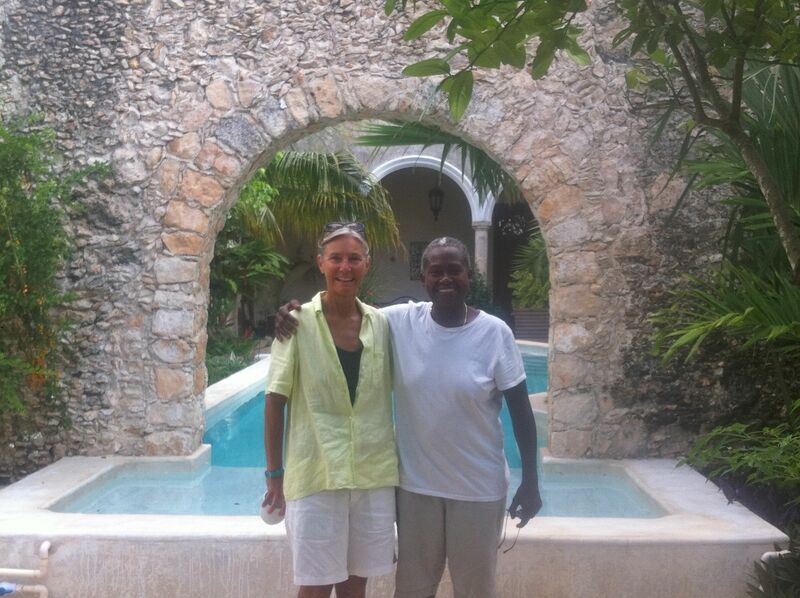 Congratulations Carolyn and Crystal for the job you have done with Casa Lunita! Casa Lunita is in the center of Baca so once you’re there you can explore the main square..They have a wonderful pool and garden area, perfect for relaxing with a book or enjoying breakfast or coffee outdoors. Great for a quiet escape from city living. We highly recommend staying here! Mi estancia fue muy agradable, me sentí como en casa con la atención de la anfitriona que puso a mi disposición todos los servicios de la casa y recomendaciones de lugares para visitar en las inmediaciones. El entorno es muy tranquilo, ideal para días de auténtico descanso. I had an amazing stay in Baca. The house (or hacienda) was beautiful and there was everything I needed. The host (Sally) was very kind. I came to relax – and that was totally what I did. This is not a place for people who want to party or are expecting resort luxury. This is a totally down to earth place where everything just seems to go a bit slower. If you are looking for a few relaxing days beside the pool this is defenitely the place for you. My experience at Casa Lunita was so much more than I expected. We were greeted by our charming hostess, Sally. She was exceptional. Can’t say enough about her. She had everything set up so beautiful. The house was beautifully restored and all of the bedrooms felt inviting. Sally even left sweet touches throughout the Casa of flower arrangements she picked from the garden and strategically placed vases in different rooms. It was so charming. It was like a lil surprise each time I found one. She made us feel so welcomed and made adjusting to such a different lifestyle than I’m a accustomed to so pleasurable. Immediately I noticed the grounds. Wow. I’m a flower/plant lover and I was truly in heaven. Not to mention the beautiful pool located in the center of this paradise. Speaking of, I had the pleasure of meeting the groundskeeper, Roger. Like Sally, he was also so very kind, sweet and polite. Both of them made us feel so welcomed. 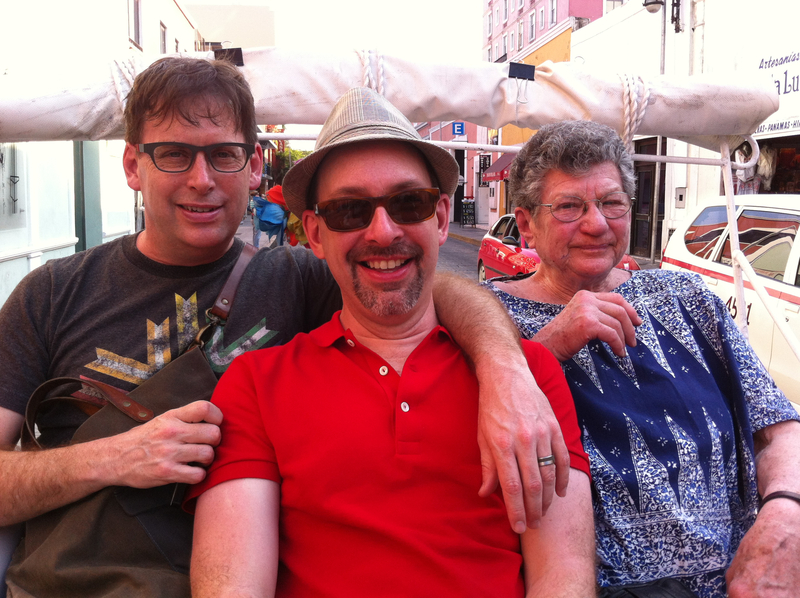 The locals were so very kind and family oriented. I must say, the nightime activities spent with the kids warmed my heart. I immediately felt a sense of comfort. The small, clean, safe village of Baca is truly authentic Mexico at its best! I even had the pleasure of hearing locals sing Ave Maria in some sort of religious/traditional ceremony. So wonderful that I was able to have witnessed. I’d also like to complement the owners of Pique Pizza. Wonderful owners and pizza was fabulous. I would suggest you try it if you ever visit this area. So, if you’re looking for peace and tranquility in a beautiful setting, Casa Lunita is your place. When in Baca, you are located within 20 minutes of beautiful beaches and within 20 minutes of Merida, the cultural center of the Yucatan. You won’t be disappointed. Everything was perfect. Special “Thank You” to Sally for making my vacation so pleasurable. Thank you to Roger for having the grounds so beautiful. Hope to be back one day. If you’re a fan of the ubiquitous, sterile, white, boxy, impersonal hotel room that you can find in every North American city with their liquor and candy bar filled mini fridges, icy air-conditioning, and 200 plus TV channels, you probably won’t like Lunita B&B in Baca, Yucatan. If, however, you should prefer small Mexican towns, stunning architecture, a gorgeous swimming pool, fascinating gardens, 20 foot high ceilings, antiques, fabulous breakfasts, sweet well-behaved pooches and charming and friendly hosts, you will find these and more at this most charming colonial house right beside the 17th century church and a few steps from the town square. We spent four days in Carolyn and Crystal’s restored colonial and were glad we did. It is a perfect base for travelling Yucatan’s roads and a quiet alternative to busy Merida. There’s much to see and experience in every direction and coming back to Lunita after a day of sight-seeing is such a treat. Awaiting is a cool pool in an enchanting courtyard, and often a great chin-wag with these lovely and interesting women. We stayed in the Blue Room which is private, large and roomy with a comfortable king sized bed and a modern ensuite bathroom. Breakfasts are a real plus…healthy, imaginative and tasty….you will be hard pressed to find a better one anywhere. If (hopefully, when!) 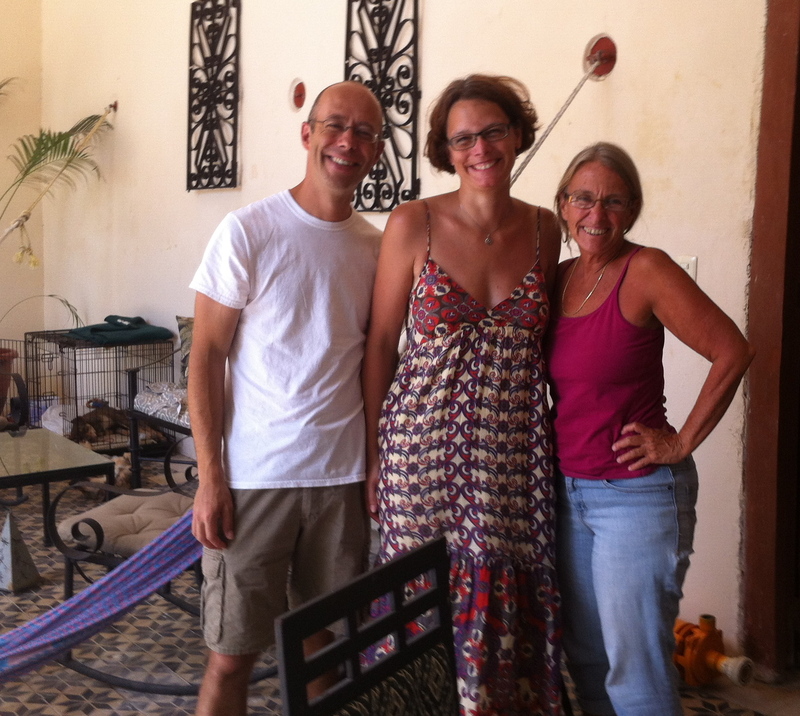 our future travels take us back to Yucatan, we will definitely return to Lunita B&B. Highly recommended! Carolyn and Crystal are warm and gracious hostesses who went out of their way to make sure my stay was comfortable. My first airbnb experience felt like I was visiting with good friends. I was even charmed by their sweet dogs … surprising given than I am an animal-neutral person. The casa has been lovingly restored. The details were a delight to discover but the jewel is their garden/pool area, which is more inviting and lush than pictured. Also, Baca pueblo was an excellent central place of respite for my exploration of the Yucatan. In fact, Baca pueblo also provided my favorite food memories. I regret that I did not have another chance to partake in the fresh fried fish “fiesta” before leaving. Good memories! Crystal and Carolyn’s place or shall I say “La Casona” is absolutely stunning. You feel like royalty the whole time you are there. They were nothing but accommodating and gracious our whole stay. Baca is a cozy little town with some special gems hidden throughout so be sure to ask C&C what they recommend. It’s there own little paradise in Baca. Looking for a wonderful escape near Merida and the golf of Mexico Then Casa Lunita is the place to go to! Baca is a little village with very nice people and its own charm. the house is a beautyful, grand house with high ceilings and a lot of charming details to discover. an adorable place. Carolyn and Cristal are wonderful, open and generous hosts who welcome their guests warmhearted and make them instantly feel home. we had a very good time together and very good conversation, eg while having delicious breakfasts. yummy! their two dogs are adorable and well behaved. the place is highly recommended, we very much enjoyed it and would definitely come again! carolyn and cristal, thanks you very much! 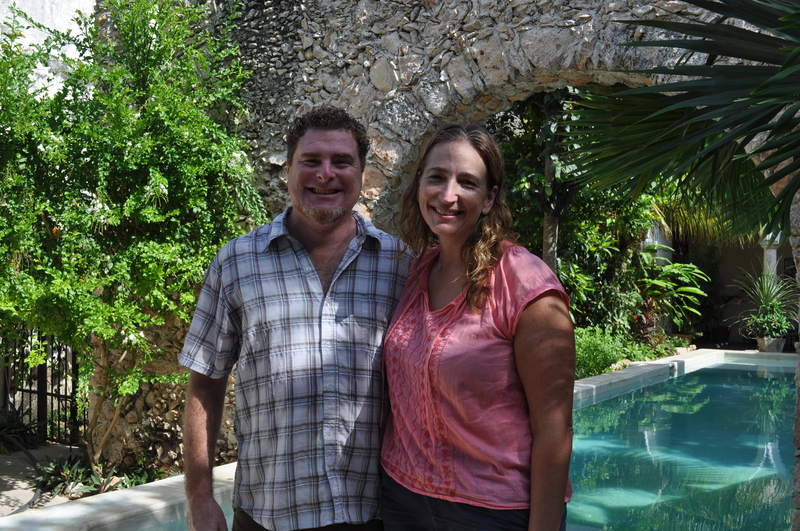 Our stay at Casa Lunita was great! Everything as described and better, we recommend it to anyone! 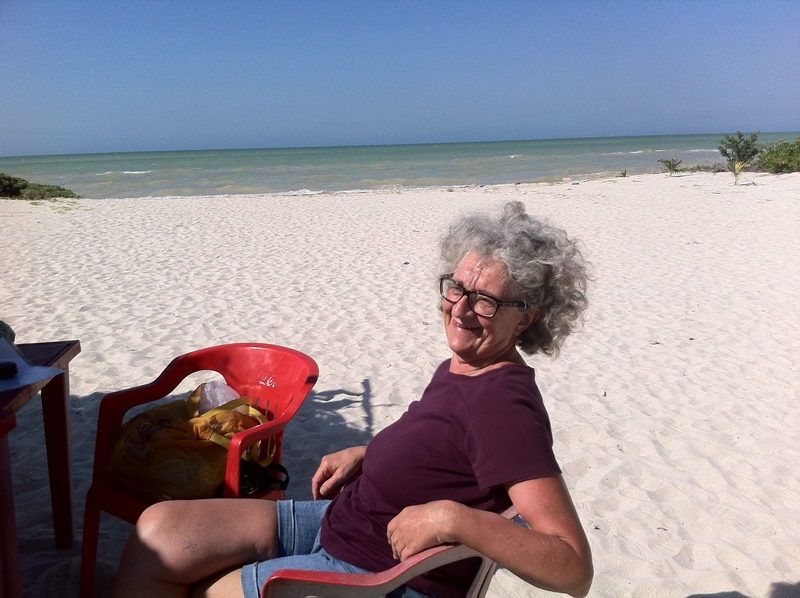 Really a little paradise – thanks to Carolyn and Crystal! Casa Lunita is a wonderful place to stay when visiting life in a pueblo. Carolyn and Crystal have created a beautiful home with beautiful gardens. I enjoyed my time in the Blue Room, surrounded by plants and the sounds of life in Yucatan. Very relaxing, friendly, and most accommodating. 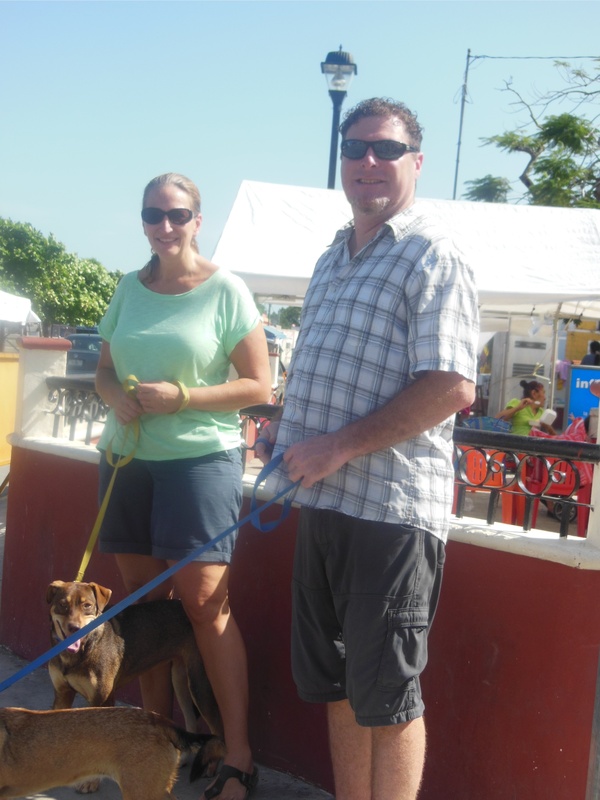 Their two sweet little dogs added to my visit at Casa Lunita. Baca is a busy little town, with a rhythm of life that was fun to discover. PS Carolyn and Crystal – I so enjoyed meeting you both. I will treasure our conversations and time together. Although I was only in Baca for one week, staying in Casa Lunita with you both and your wonderful dogs helped me to feel so rested and relaxed. I enjoyed exploring all the little corners of your town, and after being out and about, found the sanctuary you have created to be one of great delight. I hope your gardens are flourishing and your puppies are smiling, just like both of you do with such incredible light! 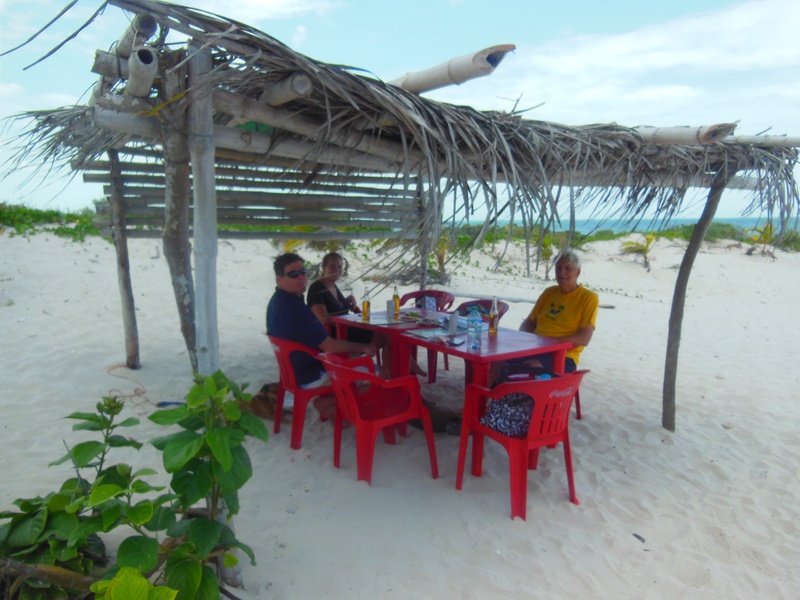 I stayed at the Casa Lunita two times, and we had a wonderful time on both trips. 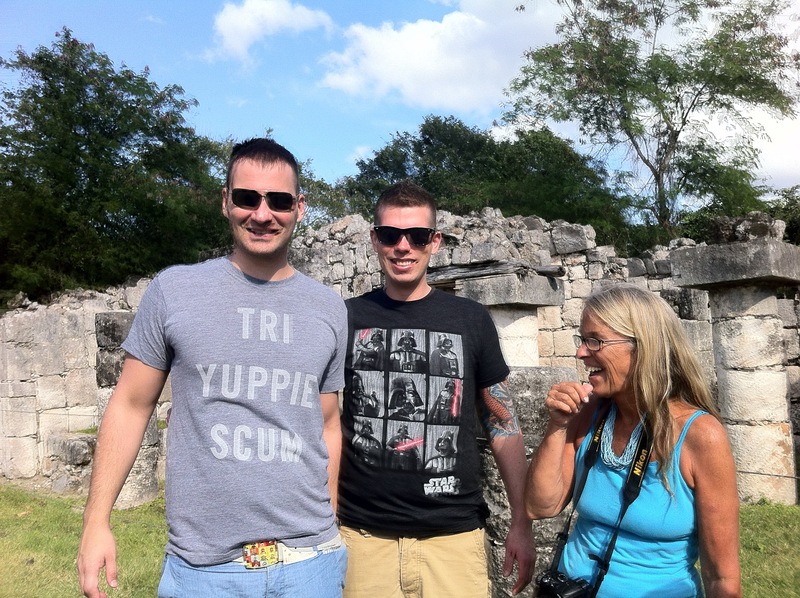 We enjoyed a number of the Maya Ruins including Chichén Itzá, Chunchucmil and Uxmál. 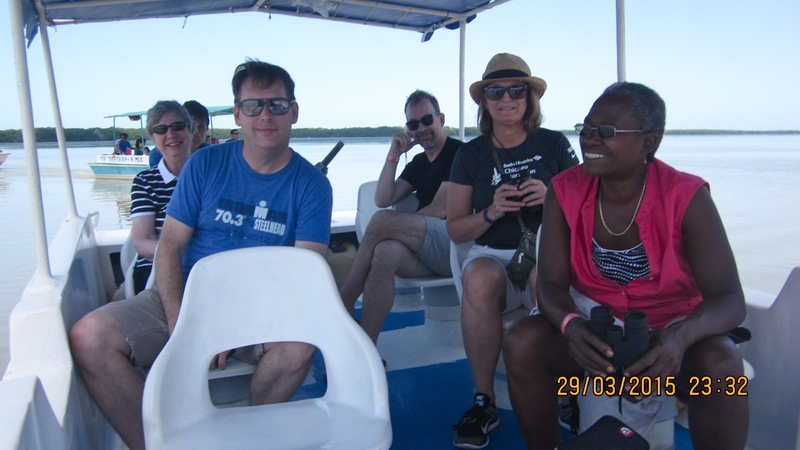 In addition to going to a number of cenotes. Highly recommend exploring some of the cenotes while in the Yucatán. Baca is a beautiful town to strolling around and shop for food, and the market was wonderful. We spend some time in Meridia but the majority of our time we spent exploring the ruins and swimming in the cenotes. 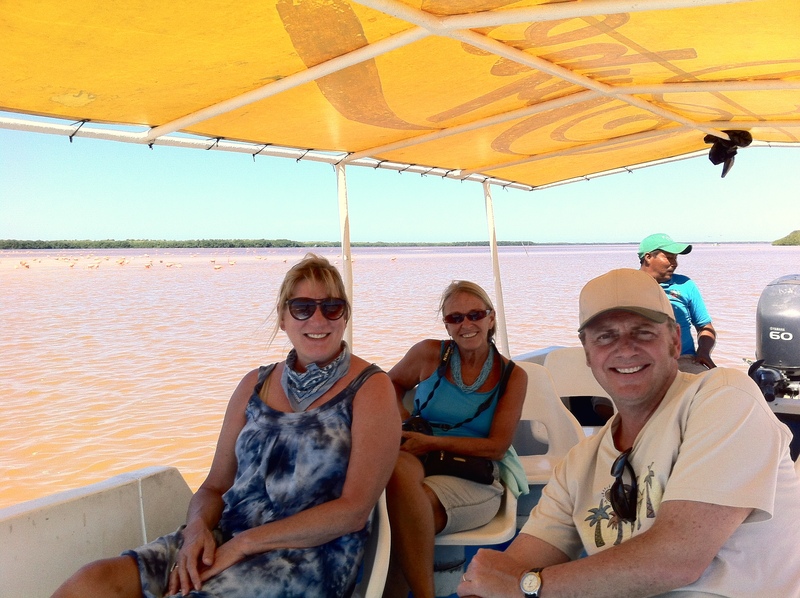 We also spend a day at the beach and went on a boat ride through the Celestun Wildlife Refuge to flamingoes and other birds. 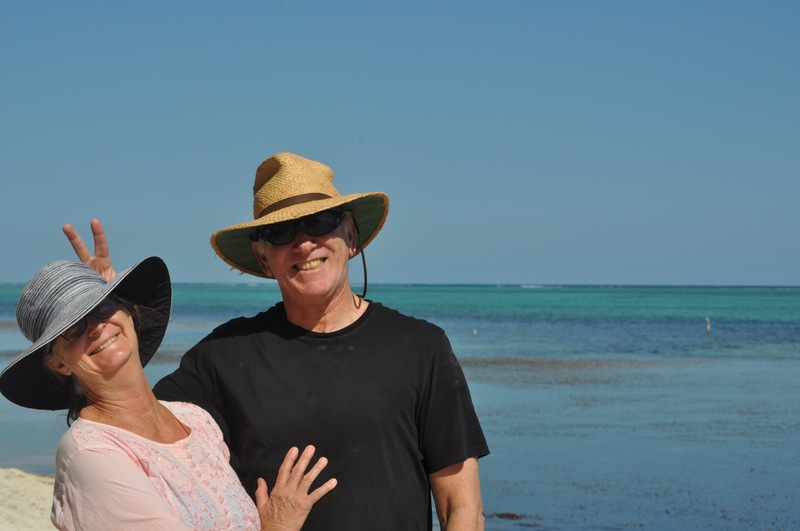 Carolyn and Crystal are wonderful hosts and have a great knowledge of the area and can assist with activities to explore and enjoy the Yucatan. Although we spent a great deal of time exploring we also found time to make dinner every night and just relax in the pool. Casa Lunita has a great deal to offer. 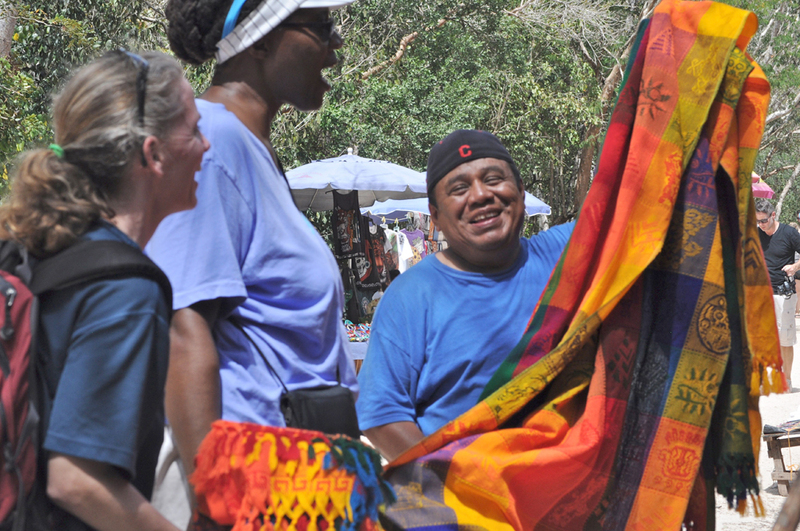 We’ll return again to explore, relax by the pool and soak in more the culture of the Yucatan. I didn’t know Carolyn when I traveled to the Yucatan to spend a week in Baca, just north of Merida, at Carolyn’s mini hacienda. The week was super. Carolyn and Crystal were gracious hosts. When we weren’t exploring the small provincial town of Baca, cycling through Merida, visiting several beaches, exploring ruins, we were relaxing at their pool and enjoying great company and delicious local food. I’ll definitely be back. I have known Carolyn for over 30 years. We have lived in the same town for a period of time, and have remained close friends throughout the years. 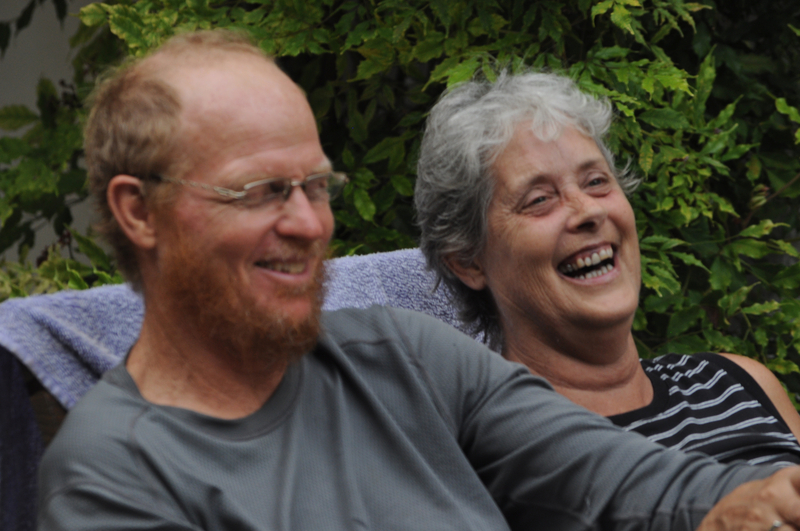 I have travelled domestically and internationally with Carolyn, and recently spent a week in Mexico at Casa Lunita. The home is beautiful and relaxing. The town of Baca is charming, and everyone in the town knows Carolyn and Crystal. We did a lot of touring around the region, and also had quality time at Casa Lunita cooking delicious meals and lunging around the beautiful pool. They will take good care of you, and soon you too will be life-long friends. What a fantastic trip! Beautiful people, history, architecture, art and the warmest welcome and care from our gracious hosts! A lovely and comfortable retreat close to a cosmopolitan city with great restaurants and museums. Swimming in a cenote is a life highlight. We cannot wait to go back. We LOVED our stay at Casa Lunita. It’s a beautiful place. Our room (Blue!) was huge, comfortable, breezy and just lovely. The gardens and pool are inviting, cool and well cared for. We loved hanging out. And Baca is a great little town undiscovered by the tourist crowd. Lovely church, great market, fresh tortilla shop, and fresh squeezed fruit juice every morning. Easy day trips to Chichen Itza, cenotes for swimming, flamingos, beaches. And Carolyn and Crystal are jewels. My family celebrated my mom’s 90th birthday for a week in the Cancun area, but we wanted to do something special for Rose’s birthday night. 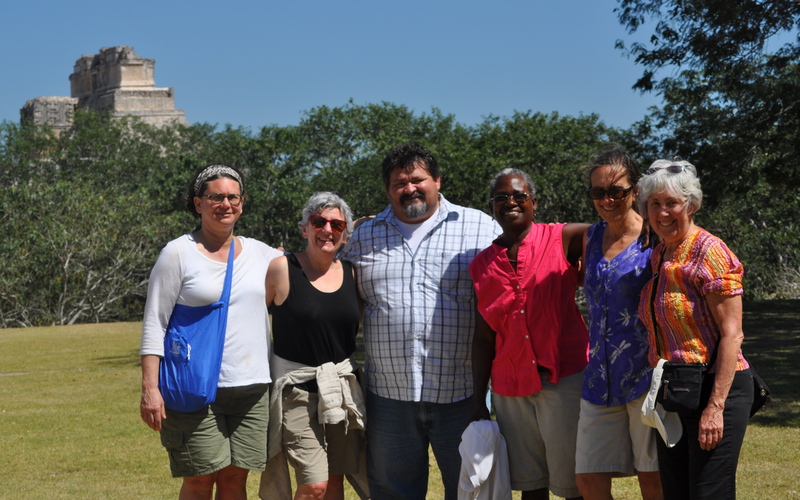 We traveled to Baca, visiting several sites along the way, and spent one wonderful night at Casa Lunita. After cocktails and snacks around the pool, Crystal and Carolyn provided a special birthday dinner in their formal dining room, and it was exquisite. In the morning, we strolled through the village, swam and lounged around the pool, and then headed back east. It was a perfect, peaceful respite from the tourist throngs. Next time, we’ll stay longer! Thank you, Carolyn and Crystal! From the moment you walk into the beautiful, lush, walled garden and take in the glorious pool you know you are in a very special place. It just gets better from there. Casa Lunita is a big comfortable house with large rooms and unique charm and character. Crystal and Caroline also have unique charm and character and will make you feel right at home. There is so much to do and see in the area. Baca is a quaint little village, and Merida is a bustling city with an old world feel and many attractions. Both are friendly and safe. We absolutely loved our stay and highly recommend this authentic private home and it’s fabulous hostesses. Can’t wait to go back and meet the puppies! Casa Lunita is as warm, welcoming and unique as its owners are. Carolyn and Crystal have created a beautiful, grand home that is a mix of old world charm and modern conveniences. And did I mention the awesome pool? They, and their two wonderful dogs, welcomed us, gave us great tips of things to do and see in the area and immediately made us feel right at home. Baca itself is a lively town that is perfectly situated to take advantage of all the Yucatan has to offer including Mayan ruins, haciendas, beaches and cenotes. We got to enjoy the charms of a small, friendly Mexican town while still only being 20 minutes from a major metropolitan city full of museums, restaurants and shopping. Overall, staying here is a truly great opportunity to experience a special place with some really special people. I had the great good fortune of being contacted by Carolyn to house and pet sit Casa Lunita and their adoreable pups, Azul and Alita, while they took visitors to the beach for a week in Feb. 2015. Everything a renovated Spanish Colonial style house should be, and more! I marveled at the attention to detail in decor, beautiful. Often in the afternoons you’ll get a visit from several to many swallows, the birds dipping and playing around the pool. I felt like I was in a magical, fairytale place. Baca is a small village that feels completely safe. I especially enjoyed the bicycle taxi to the Thai restaurant and the super healthy liquados and cheap, delicious chiliquiles at a nearby local restaurant. La experiencia en general fue muy agradable. Debido a mi amistad previa con las dueñas de la casa, fue muy fácil sentirme a gusto. Es un lugar perfecto para relajarse y tener contacto directo con la autenticidad de un pueblito yucateca. Gracias, Sally, Carolyn, Crystal. I love you!